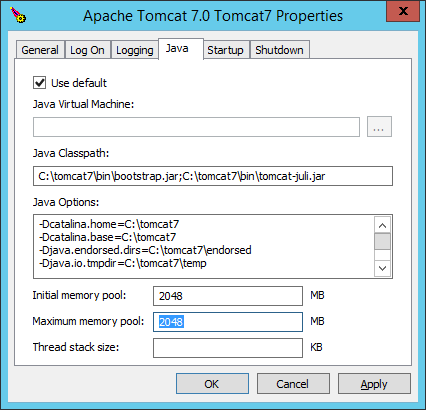 Since ApiOmat 2.4.7 the Tomcat service will allocate 70% of the system RAM. To change the heap size of your Tomcat service simply adjust the minimum and maximum values within the Tomcat configuration. Keep in mind that the initial and maximum values of the memory pool will overwrite the -Xmx and -Xms values within the Java options.